Millennials, now in their 20s or early 30s, are ethnically more diverse and better educated than any previous generation. They also demonstrate different financial behaviors that may partly reflect new trends in society and in technology. More than one in three has taken on debt for college. The share rises to half of Millennials who are either full-time or part-time students. Millennials are slightly more likely than prior generations to be offered financial education and to participate in it. Millennial men have higher financial literacy than their female peers, but this gender gap has shrunk from prior generations. This improvement still might not offset the greater need for financial capability, due to their higher student debt levels. Millennials also have different day-to-day financial habits. For example, 12 percent do not use a traditional bank – more than any other generation, including GenX (7 percent). One out of three higher-income Millennials use the high-cost services of pawn shops, pay-day lenders, and the like. They’re also two times more likely than Gen-X to pay for purchases with their cell phones: 13 percent of Millennials do, compared with 7 percent of GenX. FINRA’s full report, “The Financial Capability of Young Adults – a Generational View,” is available here. Nope, they are paid less than prior generations were at the same age, a situation likely to continue as they reach their peak earning years and face a diminished old age while paying back Generation Greed’s debts. It is only when they reach the last phase that those now under 55 will REALLY feel the pain. Unless they want to continue the pattern and ease by making the next generation even worse off. I really get where you’re coming from here. Except my Millennials ended up with what I consider good pay, my son in particular. Still, I think this latest round of free and easy monetary policy has only moved the bar farther away from them. We are building up inflationary forces that will come home to roost soon in our economy. What Millennials would actually benefit from is a bit of deflation, to bring asset prices more back in line with what they can afford. But the Fed would never allow it so all this debt is only going to be paid off via even cheaper dollars. Money habits of Millennials may set them a bit apart, but as you point out, they are nowhere near enough to explain their predicament. As the father of two Millennials, I’ve seen two very different outcomes. Personality, gender and life choices account for this far more than generational attributes. Our son got a good job in his field and paid off all his debt in about 3 years. Last year, he converted nearly $20,000 from his 401K into a Roth. He has a BS in computer science and saw no need for the expense of grad school…if he needs to learn something new, he’ll take a class or just buy the book(s) and read them. We joke he must have the first dollar he earned still squirreled away somewhere safe. Our daughter delayed grad school, traveled around Europe then worked a series of ho-hum jobs. She concluded an advanced degree was needed to get to the next level, finally completing her Masters at age 30. She financed almost all of it herself, ending up with a huge loan balance. Thankfully, she found a good job quickly and now makes enough to live on and pay down her debt. As she says, it’s like have a Mercedes payment each month, without the car. What they both say it that home ownership seems totally out of the picture for them, unless the relocate to a less expensive part of the country. Or, heaven forbid, move to the suburbs…very uncool for Millennials. The reason someone incurs debt is important. 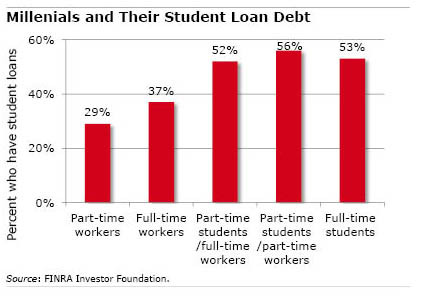 Debt as an investment in one’s skills to increase income may be reasonable, even necessary. My daughter found young women face a tougher road being taken seriously in the business world and decided an advanced degree was necessary. It also gave her a needed jolt of self-confidence that indeed, she knows what she is talking about. Of course, the media is full of stories of those who took on educational debt without the new job to justify it. I might say in that respect my daughter was lucky, but won’t because she carefully weighed her skills, interests and choices to maximize outcomes. Then again, she is a total analytic!